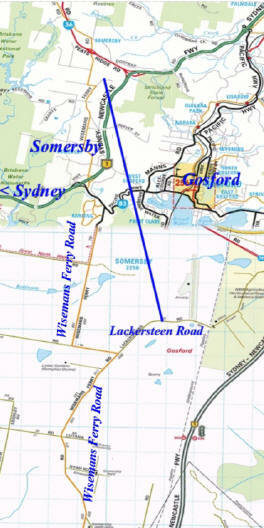 SOMERSBY AIRFIELD 89 LACKERSTEENS RD SOMERSBY. Take the F3 Freeway from Hornsby to Newcastle travelling North. Continue for 46km, and take the Gosford off ramp. After 900 metres and at the Somersby intersection, take the Wiseman Ferry Road for 6.5km. At this point Wiseman Ferry Road makes a 90° turn to the left, Lackersteens Road leads off straight. Continue with Lackersteens Road for 700 metres, and the airfield will be seen on the left hand side. Enter through gate before number 89, with sign 'KEEP OUT PRIVATE' and proceed down to the hangars. From Pacific Highway towards Sydney. At West Gosford turn right at Dyer Crescent and then immediately left into Debenham Road South for 2.5km, turn left into Gindurra Road continue for 500 metres and turn right into Wisemans Ferry Road. Continue along Wiseman Ferry Road for 4.9km and the road makes a 90° turn to the left, Lackersteens Road leads off straight. Continue with Lackersteens Road for 700 metres, and the airfield will be seen on the left hand side. Enter through gate before number 89, with sign 'KEEP OUT PRIVATE' and proceed down to the hangars. From the F3 Freeway to Sydney, take the Peats Ridge Central Mangrove Somersby off ramp (1st after Ourimbah), continue for 2.7km, and turn left onto Wisemans Ferry Road. After 2.5km Wisemans Ferry Road makes a 90° turn to the right. At this point turn left into Lackersteens Road, continue for 700 metres, and the airfield will be seen on the left hand side. Enter through gate before number 89, with sign 'KEEP OUT PRIVATE' and proceed down to the hangars.